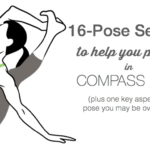 For a comprehensive preparatory sequence to Compass Pose, check out my 16-pose sequence. For those of you that are teachers and want to bring your own craft to the table, focus on preparing your students with simple side bends, hamstring, and inner leg openers. Weave standing postures such as Triangle, Side-Angle, and Wide-Legged Forward Bend into your sequence. Also, including Parivrtta Janu Sirsasana and Parivrtta Upavistha Konasana will prep your students adequately. Throw in a few Sun Salutations and your students will be good to go. Once you are warmed up, here’s how to get into the pose step-by-step. 1. Sit with your feet together and your knees wide apart in Baddha Konasana (Bound Angle Pose). 2. Using both hands, pick up your left leg. Imagine your left leg is like the strap of backpback and you want to sling it over your upper-arm. Tuck your left shoulder behind your knee and wiggle your leg up as high as possible. Now that your leg is placed on your left arm, place your left hand on the floor in line with your hip. Slide your hand a foot or so away from your hip and externally rotate your bottom arm. 3. The whole time you’ve been holding onto your foot with your right hand. If you’re tighter, clasp your big toe with your index and middle finger. This will make the pose slighlty more accessible. If you’re more flexible, you can hold onto the outside of your foot. This will allow you to stretch your side body more deeply. 4. Slowly straighten your left leg diagonally up and away until you come to the end of your range of motion. 5. Now that you’re in the pose, refer to the visual callouts in the image above! 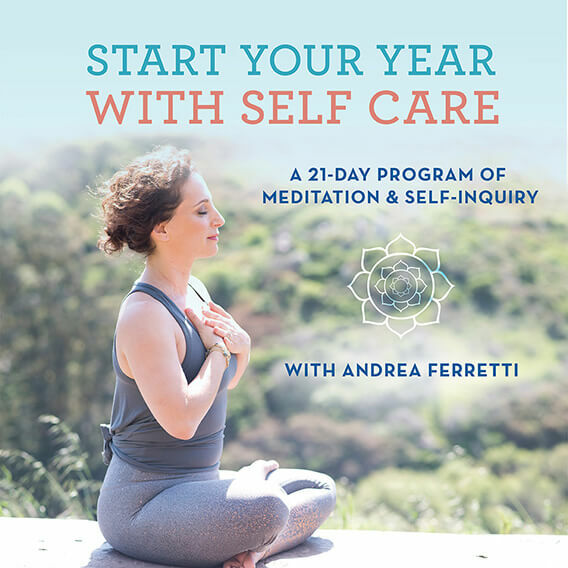 If you’re feeling the beautiful, spaciousness of the pose bask in it. Savor it. If you’re stuck in the mud, not moving anywhwere because your hamstrings + adductors, and side-body won’t budge, build resilience. Breathe in despite the drudgery—better, breathe into the drudgery. You’re fine. This is just how some postures feel. You’re not alone. 6. Take a few breaths in the pose, directing your inhalations into the stretch of your side body. IF I CAN’T DO COMPASS YET, WHAT SHOULD I DO INSTEAD? The majority of practitioners that get stymied in this posture have restricted hamstrings. To create more hamstring flexibility, focus your energy on highly efficient hamstring openers like Supta Padangusthasana (Reclined Leg Stretch) and Prasarita Padottanasana (Wide-Legged Standing forward Bend). Practicing seated hamstring openers like Upavistha Konasana (Seated Wide Legged Forward Bend) is also useful. If you want to get a big-ole side bend that circumvents your hamstrings, sit cross-legged and do a side bend from there. WHICH MUSCLES DOES COMPASS STRENGTHEN? 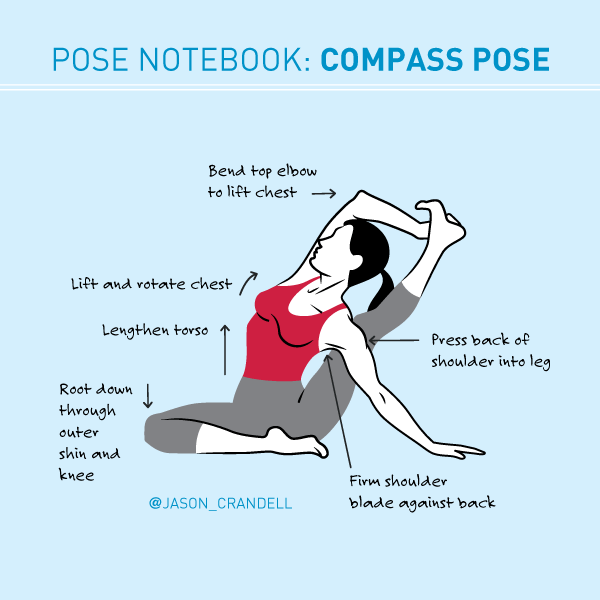 Compass pose isn’t exactly “core” work, but if you engage your transversus abdmoninus in the pose, you’ll create stability that will support the overall integrity of the pose. To engage this key muscle, draw your navel toward your spine and lift from center. Your spinal muscles—especially your erector spinae—get a very mild workout in Compass. You will be engaging this muscle group when you lengthen up through your spine in the posture. WHICH MUSCLES DOES COMPASS STRETCH? Your entire hamstring group, made up of your semimenbranosis, semitendinosis, and biceps femoris are stretched in Compass Pose. Your top leg is abducted—meaning it’s reaching away from your center line. This means that your medial hamstring, your semimembranosus might get the deepest stretch in the group. Similar to your hamstrings, your entire adductor muscle group is being stretched. Due to its relationship with the hamstrings, your adductor magnus is under the most significant demand in this posture. It’s likely that your gracilis has the second greatest amount of stretch in your adductor family. Your outer hips aren’t lengthening to the same degree as your hamstrings or adductors, but they are being stretched mildly. It may be hard to notice, given the demand of your other muscle groups, but your abductors, especially your gluteous medius are lengthening in Compass. Oh, sweet, oft-neglected side body, it’s your time to shine. Your side body is a big, long continuum of muscle and connective tissue that blends together and forms a seam—not unlike the side seam in your clothing. The three muscles of your side-body that are stretched the most in Compass are your latissimus dorsi, obliques and quadratus lumborum. Releasing tension in these muscle groups will leave you feeling happy you decided to tackle this pose. You can find a fully-illustrated, 16-pose sequence for Compass here. These are great visuals! I wish I’d had them when I was in teacher training. What a wonderful reference, thank you! Thanks, Jen! You could, ahem… always do another training–perhaps my 300-hr program because all of these visuals were originally built for my teacher-training program! 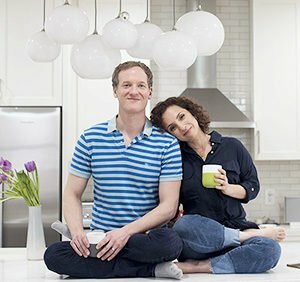 I love your posts with the visuals and descriptions as well as the sequence postures. Thank you! Thanks, Bonnie! There are many, many more to come. Stay tuned! Awesome post! Thanks for sharing such amazing content. Looking forward to collaborating!